The blood and flames of 2008 happened exactly three years ago. Many Tibetans had to sacrifice; many Tibetans are still suffering in prison today. The oppressors’ snipers are still standing above Tibetan people’s heads; on sunny days, the beams deflected from the guns in their hands stab into the prostrating Tibetans. This is a collective memory which has been engraved on Tibetan people’s hearts. 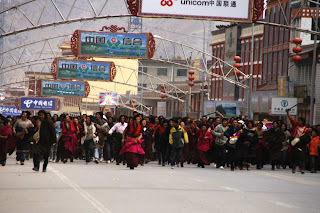 Starting in Lhasa on March 10, 2008 in, protests spread throughout Tibet. Tibetan monks took to the streets to protest against oppression. However, amongst Tibetans, we can also discern some other differing voices, saying that the uprisings in those three Tibetan provinces should not have occurred because they only brought about merciless oppression and ever more emphatic changes in policies causing the previously gained space to once more diminish. For example, many charitable foundations in Tibet were not only closed down, they will never reappear and the only thing we can do is engage in endless compromises to protect ourselves. Foundations or NGOs portray advantageous morals of political correctness because they engage in charitable work. But now that charitable work cannot be carried out anymore, it is understandable that people complain. Yet, those standing in the way of charitable work are by no means the protestors, the ones responsible are the oppressors. So it is necessary to discuss the accusations against the protestors and the silence towards the actual oppressors. One Tibetan working in the government said that the 2008 protests were not wrong. Internally, it activated the national consciousness that had long been locked in people’s hearts; for the outside world, it exposed the delicately woven veil that had been covering Tibetan people’s faces, made visible to the world Tibetans’ true faces, and made the world hear the cries coming from the bottom of their hearts. A middle school Tibetan teacher said that the 2008 protests taught us that pain must be given vent to; it cannot be buried in one’s heart. But even more importantly, we take matters into our own hands and we cannot rely on His Holiness, the Dalai Lama or other intellectuals or the elite. Hence, every one of us must embark on the path of striving for individual rights. A Tibetan author said that the 2008 protests spread the following sentence throughout the whole of Tibet: Tibetans stand together through thick and thin. The protests weren’t incited by anyone else, they were started by the people themselves and they represented the people’s aspirations, their attitude and standpoint. Some people who think that the people were too reckless are those who consider themselves having great foresight and able to decide on behalf of other people what they should or shouldn’t do. This elitist way of thinking in fact lacks any kind of sense of responsibility to take things into one’s own hands and it lacks even more any public concern for the benefit of one’s own nationality. Another Tibetan author said that the 2008 protests have become a milestone in the history of Tibet. Over the past three years, in many areas in the Tibetan areas, people were discussing issues of national feelings and national dignity as if they had just regained consciousness. Just like the lyrics of the song “The Sound of Unity”, which conveys what Tibetan people think, say: "O Tibetans! Unite, unite! If you think of the sadness on the face of your father, O Tibetans! Unite, unite! Tibetans of the Land of Snows unite. O Tibetans! Unite, unite! If you think of the tears from the heart of your mother. O Tibetans! Unite, unite!" An influential monk opposed the view that those engaging in the protests in 2008 were only a minority of people. This opinion was prominent among people and in areas that have been quite obviously Sinicised. Probably only those who are rather calculating and anxious for their own advantage, think in this way. No doubt, this is because the protests have led to the deterioration of the situation for Tibetans, but relative to what people throughout the entire region are facing, it cannot be called trouble. Tell me, please, is the interest of the entire nationality important or the interest of individuals or organisations? Also, this was an opportunity to gain some practical experience and inner strength, thus increasing the courage to face hardships. A monk who was arrested and endured torture because he had taken to the streets three years ago said that the 2008 protests serve as proof; if there had not been any protests, it would have meant that the Chinese government’s rhetoric of “self-liberation” of the Tibetan people and Tibetans being “the happiest people” may in fact be true. But as the protests did occur, it shows even more that these words are simple lies. The 2008 protests were a success, they revealed Tibetan people’s national consciousness, which had been sealed in their hearts, they gave Tibetans hope for the future, and even though they also made Tibetan people’s lives even harder than before, this is a reason why there will be more protests to come. The more protests occur, the better it will be for the Tibetan people; it will make more and more people see the true situation, if it happens again, I would still be in the front line. Translated and published by High Peaks Pure Earth. Reprinted with permission.